Guitarist Thornel Schwartz was in the frontline of the organ combo scene. A typical sideman, he only recorded one album as a leader, the 1962 Argo album Soul Cookin’, which presents a bonus in the guise of Hammond organ giant Larry Young, who performs under the pseudonym Lawrence Olds. Isuppose Thornel Schwartz realised soon enough that his path wasn’t going to resemble that of Grant Green, George Benson, Pat Martino or Joe Pass, amazing guitarists that also woodshedded in r&b and soul jazz but, unlike Schwartz, became leaders in their own right. Nevertheless, Schwartz, born in Philadelphia on May 29, 1927, and no doubt a solid, characteristic guitarist, could look back at the end of his life (he died prematurely at the age of 50 in 1977) on a career in the frontline of the popular soul jazz genre. Schwartz was a sideman to many leading organists of the day, beginning with the pioneering master of the Hammond B3, Jimmy Smith. Schwartz, who was associated with Philadelphian singer Don Gardner (at the same time as Jimmy Smith) and singer/pianist Freddie Cole from 1952 to 1955, hooked up with Jimmy Smith in 1956. Bullseye. Schwartz found himself featured on Smith’s albums that made the organ a viable modern jazz instrument and were extremely popular to boot. Schwartz appeared on Smith’s A New Sound A New Star – Jimmy Smith At The Organ Vol. 1 & 2, The Incredible Jimmy Smith At The Organ Vol. 3 and At Club Baby Grand Vol. 1 & 2. After a stint with Johnny “Hammond” Smith in the late fifties, Schwartz joined the group of another revolutionary organist, Larry Young, in 1960. Still working as a soul jazz musician, Young nonetheless showed potential as an innovator on the sessions Schwartz partook in, Testifyin’, Young Blues and Groove Street. Subsequently, Schwartz worked with Jimmy McGriff, Reuben Wilson’s early career group Wildare Express and Charles Earland in the sixties and Richard “Groove” Holmes in the seventies. Schwartz from Philly. With Smith, McGriff and Earland from Philly, organ jazz city without parallel. To say the least, Mr. Schwartz knew where the action was at! Solely responsible for the modern organ jazz revolution, Jimmy Smith did have an expert companion in Thornel Schwartz. The uptempo tunes in Smith’s book (The Way You Look Tonight and The Champ from A New Sound A New Star, Sweet Georgia Brown and Get Happy from At Club Baby Grand) show that Schwartz played his role in setting the standard for future organ combo’s. His boppy comping, supported by deft accents on the bass string, clipped notes and the propulsive, relentless groove Schwartz and Smith generate, which suggests a liking for Django Reinhardt’s tight-knit gypsy swing, set the standard for playing in the organ combo. The method is commented upon by Babs Gonzalez in the liner notes of A New Sound A New Star, which further illustrates the relevance of Schwartz: ‘They were always singing new arrangements in the car while traveling.’ That is, when Babs wasn’t intervening with some lengthy, expoobident recitations of bopswing poetry. A proficient blues player who talks the bop language without really, like better guitar players, stretching long lines over the familiar changes, Schwartz accompanies his short clusters of prickly, staccato notes with driving octave playing. The blues tunes on Soul Cookin’ benefit from Schwartz’ more crude than refined approach, although the entrance in the title track, lame as a duck with the flu, nearly kills the tune, but he regains his posture with simultaneously down-home and boppish statements. His peculiar, overdriven tone might get on your sleeve, yet gives that extra edge and is instantly recognizable. 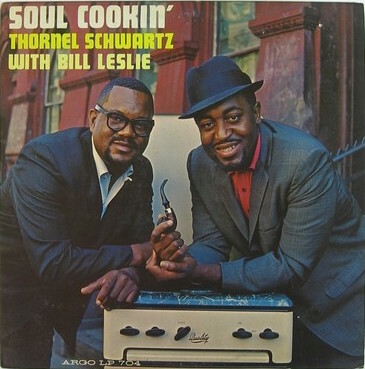 Soul Cookin’ was released six years after Schwartz’ stint with Jimmy Smith and Thornel’s sound hadn’t changed one bit. A jazzy creature of habit! Soul Cookin’ presents not only blues but exotic grooves like Brazil and standards and popular song like Theme From Mutiny On The Bounty. Bill Leslie, a lively, original tenor saxophonist whom Schwartz cooperated with on Leslie’s Diggin’ The Chicks, lures The Bounty to the shore of Rio with some hot and quixotic blowing. Larry Young, or Lawrence Olds (the off-beat pseudonym that precedes the wordplay of Young’s 1973 Lawrence Of Newark album) comps tastefully and makes the most of his few solo spots, elevating You Won’t Let Me Go to a song you wouldn’t want to let go, spicing his excellent blues lick bag with frivolous runs up the scale. Schwartz is duly stimulated, sends his car into the grind, only to regain speed for a commoving ride around the track. A moment that’s reminiscent of the chemistry between Jimmy and Thornel in 1956. Listen to the Soul Cookin’ album here.